Goals can be made for short and for long periods of time. Not only can you make academic goals but you can make a record of other types of goals such as character goals, personal growth, personal improvement, etc. Make goals and objectives at the beginning of the year and during the year based on your child's work and work habits. 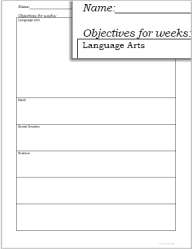 The Objectives Form may be used for periods of weeks or for long term. I recommend reviewing objectives at least every 6 weeks. If you print 6 of these, space them in your planner between 6 weeks worth of lesson planner pages. Print the backs with a ruled file if you want to make comments along the way regarding the objectives. Examples of objectives could be taken from standards lists. Standards can be found on the internet, schools post them and one that is easily accessible is at World Book. Another place to look for objectives, and this is something that I did in addition to using World Book standards, is from your children's work and observing how they work. As they work, you will see where they need to work a little harder, and if there are places in which they need more tutelage, and that sort of thing. Keeping a record of short-term objectives is optional, but when I kept the records, I found that the lists helped me plan my children's work with improved purpose and the lists helped me in the daily direction of teaching. The same sort of idea is behind the Goals Forms. 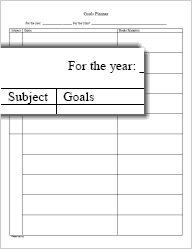 The goals forms have a different layout and allows you to set a goal or various assignments along with the books and resources. 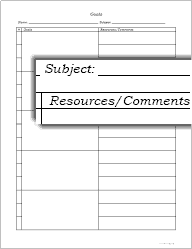 Use for one subject per printed page. Use for two subjects or two parts of one subject such as spelling and reading in the subject of language arts. Make a detailed plan of action to tackle one specific goal (or problem area). This scope planner can be used to break down a goal into specific steps. Or it can be used to plan a series of classes to teach one particular thing.